Dauphine Island New reports have finally trickled out on a “last and final” deal between government regulators and the nation’s big banks over their irresponsible, immoral fleecing of consumers around home mortgages leaving millions as foreclosure victims. Nothing about this settlement sounds really good for consumers particularly. The whole thing smacks of end of the year, desk cleaning for government bureaucrats and bank lawyers looking to end the year with a big payday. Negotiations were top secret with word only coming out recently. Cost of the paperwork trying to establish how banks fleeced consumers is mired in huge time sucking cost overruns (about 20 hours per loan file), and the estimated multi-year delays from these dilatory and expensive bank reviews could drag out for years. Regulators proposed a $15 billion settlement on all outstanding matters, which would be cheap at 5 times that price, and the terms are already down to a potential $10 billion dollar deal. You want to know more? Are you sure? All 14 of the major banks are reportedly ready to sign. Let me tell you something for certain. The only thing all 14 major banks would ever be ready to all sign is the list for a free lunch! This all has the feeling of a velvet pillowcase being pulled over all of our heads so that the banks can get back to business without this in the background. Was it only a week or two ago that we read the report that the banks are ticking off the Federal Reserve officials because they are profiteering on interest rates and refusing to move them down to the level allowed by the cheap money policy of the Reserve? This settlement can be paid out of the margins of what they are fleecing on new loans right now! Under the terms of the settlement being negotiated, $6 billion would come from banks to be used for relief for homeowners, including reducing their principal, helping them refinance and donating abandoned homes, the people said. All of those things the banks should be doing on their own, and simply uses the money pitched in by the 14 banks to spread out losses on their balance sheets, transfers the money back to them in fact, and claiming “all the way to the bank” that they are helping their victims. Hard to see any justice in this, but the point from the government and bankers seems to be to at least put us all out of the misery of continuing to read about it or foolishly hope that there will ever be any real relief or justice at the end of this fiasco. 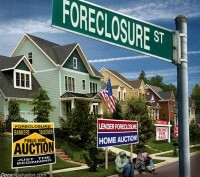 Housing Help or More Bank Bailout? Lafayette More headlines, and more hopelessness seems to emerge around housing policy in the United States as both homeowners and others desperate about the economy desperately read between the lines looking for an answer and only finding more cluelessness, even as some nuggets of the Obama Administration’s failed policies continue to slip out. This time the proposals floated have to do with refinancing houses with Fannie Mae and Freddie Mac guaranteed mortgages and renting homes facing foreclosures. No one can puzzle out whether or not homeowners facing foreclosure or owing more than 125% of what is now the current value of the house would be allowed to refinance, thereby making their homes affordable again. I suspect not. This would knock too hard on the door that the banks have continued to fortify which would involve writing down the value of the properties to the market, rather than continuing to pretend to modify at the wildly inflated pricing. The Times article in its last line importantly noted: “American homeowners currently owe some $700 billion more than their homes are worth.” My god in heaven until that issue is addressed there is no plan for beleaguered homeowners facing the threat of foreclosures. A refinancing program that focuses on other homes than represented by that $700 billion problem would give banks and the housing industry a shot in the arm on closing costs and fees in the moribund housing market. This is all window dressing, not housing policy! A Treasury Department official was quoted revealingly that Treasury was now hoarding more than half of the money allocated by TARP for foreclosure relief (almost $25 billion!) which has been an abject failure on all counts saying they wanted to save it to help pay down the deficit. What patsies: this is more chicken feed for the chickenhearted! As a footnote to all of this we have to read about Warren Buffett being a “white knight” trying to prop up Bank of America still wallowing in its mess, and a new debate over whether or not Capital One might be getting “too big to fail.” These are not the real issues, friends. The other proposal has to do with renting out homes facing foreclosures but that would require some money to operate, some concessions from the banks which have not given an inch yet, and some recognition that tenancy is part of the future paradigm of citizen wealth, just as home ownership has been in the past. Unfortunately no political or financial figures have been willing to walk that bridge to the future yet, so we’re still all falling into the ravine.